In the temples of India, the 9 planets are arranged in a cyclical pattern reflecting their positioning in the sky. The Sun is in the middle with other planets rotating around them. The knowledge that the world was round and the Sun was the center of the Solar system was known to the ancients of India long before the Western counterparts of Galileo and Columbus proposed these ideas. It was the Maharishis, the Great Seers, who gained keen insight into our solar system and how we as humans are influenced by each planet. They established statue representations of the planets and invoked the energy of the planet into the statue. Through praying to the statue representation of the planet a person was able to more easily establish a connection to the planetary energies and shift their own consciousness and karma. This served to help many humans mitigate their bad karma. But around 3500 B.C., one the powerful 18 Tamil Siddhas of Southern India by the name of Idaikkadar saw that a devastating drought that had set in was going to last for 12 years, causing untold sorrows and death for the people. Idaikkadar lived in the remote jungles, but he still decided to act on behalf of humanity. By use of his yogic skills he was able to change the directions of how the planets faced each other. In 2008 the most powerful of seers by name of Brghu requested Sri Dattatreya Siva Baba through a jeeva nadi reading to again rearrange the planets for the benefit of mankind. The siddha Brghu saw that because the planets are still arranged in a circle, karmas will return to an individual again and again as the planets rotate. While you can mitigate a bad karma, the next cycle will bring the same problem. 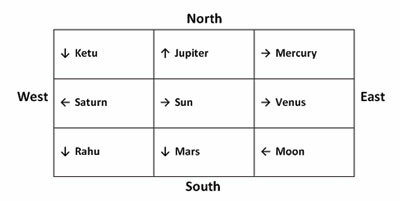 In the near future, Astroved.com will also be offering Navagraha (9 Planetary) statues aligned in this new direction for your own use at home. The planetary poojas and rituals Astroved performs on your behalf at the Sri La Sri Dattatreya Siva Baba Ashram in Chennai will be conducted on this new arrangement only as of February 1st, 2009.